As an architect and a citizen, Victor Deneka left a significant mark on Winnipeg – particularly through his extensive work for the Ukrainian Catholic Church. Deneka was born in Samarkand, U.S.S.R. (now Uzbekistan) on June 25, 1921. 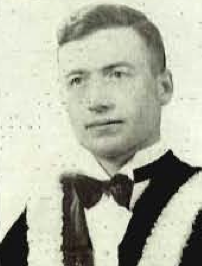 Following his graduation from the State Grammar School in Cholm, Western Ukraine (now Poland) in 1944, Deneka pursued a degree in architecture from the Carolo-Wilhelmina Technical University in Brunswick, Germany; here he was supported by means of a scholarship awarded by the British Military Government in Germany’s post-war British Zone. In 1949 Deneka immigrated to Canada and, by 1952 he earned a second Bachelor of Architecture, this one from the University of Manitoba. A member of the Manitoba Association of Architects and the Royal Architectural Institute of Canada, Deneka’s architectural practice was varied. Amongst other positions, he served as staff architect for the Canadian National Railways Prairie Region. However, it is through his work for religious organizations that Deneka is best known. Such projects include his designs for Winnipeg’s Blessed Virgin Mary Ukrainian Catholic Church (965 Boyd Avenue, 1962), St. Basil's Ukrainian Catholic Church (202 Harcourt Street, 1974) and St. Anne's Ukrainian Catholic Church (455 Douglas Avenue, 1984). In addition, examples of Deneka’s Winnipeg architecture include a consistory building for the Ukrainian Catholic Archdiocese of Winnipeg, the offices of the Ukrainian Fraternal Society of Canada and a building for Plast Ukrainian Youth Association. Deneka is furthermore known for his Ukrainian Catholic churches outside of the city at Beausejour, Dauphin, Portage la Prairie and Russell. Many of these designs are notable for their unique fusion of modernist aesthetics and elements of traditional Ukrainian church design – amongst the latter, turrets, cupolas and distinctive roof silhouettes. Following his retirement, Deneka maintained a scholarly interest in Ukrainian church architecture, participating in numerous conferences on the subject and working toward a lengthy, well-illustrated book Ukrainian Churches in Canada. Deneka was an active member of a variety of community organizations. Amongst other projects, in 1953 Deneka helped put together the first congress of Ukrainian Catholic university students of Canada; this event led to the creation of the national student federation Obnova. Deneka later served as president of the Obnova Alumni Society, president of the Archdiocesan Executive of the Ukrainian Catholic Brotherhood of Canada, president of the Ukrainian Catholic Council of the Winnipeg Archdiocese, national president of the Ukrainian Catholic Council of Canada and an honorary director of the Catholic Foundation of Manitoba. In addition, Deneka was a member of the Board of Directors of the Ukrainian Canadian Foundation of Taras Shevchenko, secretary of the Ukrainian Literary and Arts Club of Winnipeg and an active member and president of the Ukrainian Academy of Arts and Sciences. Notably, in November 1982, Deneka was named a Cavalier of the Order of St. Gregory the Great by Pope John Paul II; this title is given to distinguished persons for notable accomplishments in the Church and in the community in general. Deneka was also the recipient of the highest honour of the Ukrainian Catholic Brotherhood of Canada, the Order of St. Vladimir the Great. He died at Winnipeg on 3 April 2010 and was buried in All Saints Cemetery. “Victor Deneka – Obituary.” Winnipeg Free Press. 6 April 2010.